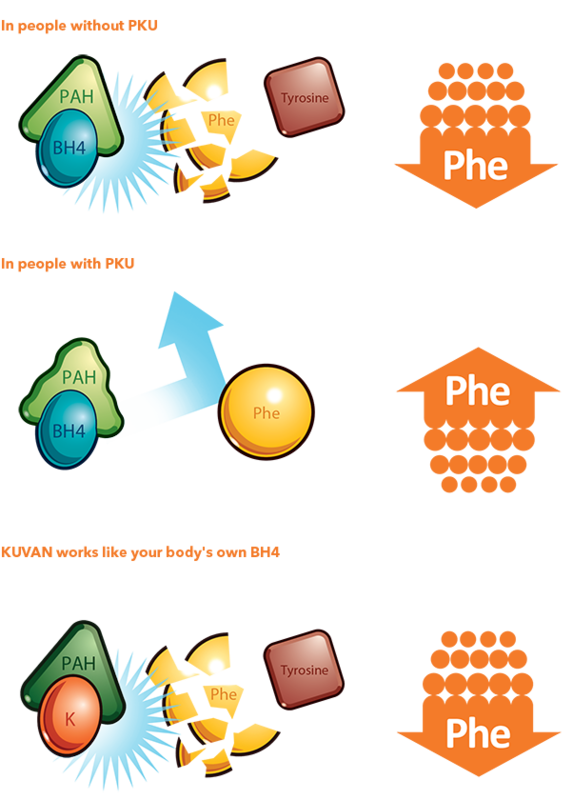 In the body, the PAH enzyme converts Phe into tyrosine in the presence of tetrahydrobiopterin (BH4). BH4 is a natural substance found in the body that helps the PAH enzyme reduce Phe to safe levels in the blood. The active ingredient in KUVAN® (sapropterin dihydrochloride) Tablets or Powder for Oral Solution is a pharmaceutical version of BH4. It works in the same way as your body’s BH4. KUVAN adds more BH4 and stimulates the PAH enzyme to process Phe in people with PKU. The PAH enzyme begins to convert Phe to tyrosine, and helps to keep your blood Phe levels low. KUVAN has been prescribed along with a low-Phe diet to lower blood Phe levels in many people with PKU of all ages and across all ranges of symptoms.